Yes, this is the second time you’ve seen this picture in my blog. It was posted with a poem, Daybreak, in late August and now it reappears to accompany a second poem it also inspired, Daybreak II. A single picture on paper, on the screen or in the memory has a powerful, persuasive control of our imagination. This beautiful photo by my friend and photographer, Yolanda Litton, has done just that. I’ve included an audio clip of me reading the poem. Click on the link below and wait a few seconds. Is as if I were stepping into someone else’s life. Rises slowly to reveal a house of soft honeyed stone. Where the swifts are now resting after a long evening hunt. Its eyes in that inscrutable feline way and disappears. What my life would be like had I been born here. Is my religion, my serenity, my salvation, my Eden. 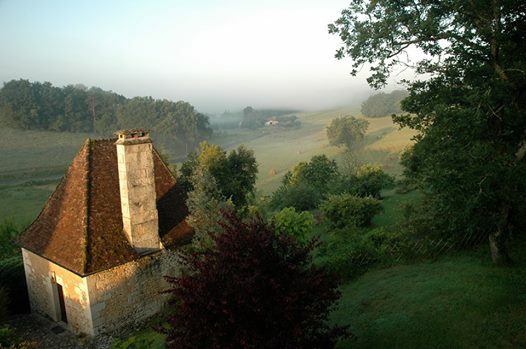 This entry was posted in meditative poem, memories, nature poem, poem, Poems, poetry, Time and tagged daybreak, Eden, fog, gray cat, inscrutable, Mary Kendall, morning meditation, poetry, serenity, south of France, Yolanda Litton photography. Bookmark the permalink. Good morning Mary.. Many thanks first of all for clicking the follow button to my Dreamwalker’s Sanctuary.. Wonderful.. Nature and each day that breaks brings us hope and salvation as we see first hand how we are all One.. Many thanks for your visit.. Thank you, Sue. I am glad this poem spoke to you in this way. It’s always so lovely to find a connection through nature and art. We are all One. Best wishes. This is just lovely–a meditative moment upon awakening. I liked what you added about the haiku form, as well. Your poem reminds me a bit of Mary Oliver…and that’s about the highest compliment I can give. I turn to her poetry when I need a moment of respite in nature. Thank you so much, Victoria. I’m honored by the comparison. Your writing is so very beautiful. Serene. Reflective. Invitational. Thanks your recent visits and for your kind comments. I came visiting here yesterday and was so taken with your writing I didn’t know what to say! I’ve decided thank you will do very well… .So. Thank you for sharing your gift. Beautiful!!! Love your poems! You are a great poet! Thank you so much, Randy.